The excited electrons have enough energy to leave the chlorophyll a molecules. Because they have lost electrons, the chlorophyll a molecules have undergone an oxidation reaction. Remember that each oxidation reaction must be accompanied by a reduction reaction. So, some substance must accept the electrons that the chlorophyll a molecules have lost, as shown in step ©. The acceptor of the electrons lost from chlorophyll a is a molecule in the thylakoid membrane called the primary electron acceptor. In step Q, the primary electron acceptor donates the electrons to the first of a series of molecules located in the thylakoid membrane. These molecules are called an electron transport chain because they transfer electrons from one molecule to the next. As the electrons pass from molecule to molecule in the chain, they lose most of the energy that they acquired when they were excited. The energy they lose is used to move protons (H+) into the thylakoid. In step O, light is absorbed by photosystem I. This happens at the same time that light is absorbed by photosystem II. Electrons move from a pair of chlorophyll a molecules in photosystem I to another primary electron acceptor. The electrons lost by these chlorophyll a molecules are replaced by the electrons that have passed through the electron transport chain from photosystem II. The primary electron acceptor of photosystem I donates electrons to a different electron transport chain. This chain brings the electrons to the side of the thylakoid membrane that faces the stroma. There the electrons combine with a proton and NADP+, an organic molecule that accepts electrons during oxidation/reduction reactions. As you can see in step G, this reaction causes NADP+ to be reduced to NADPH. For every two molecules of water that are split, four electrons become available to replace those lost by the chlorophyll molecules in photosystem II. The protons that are produced are left inside the thylakoid, and the oxygen diffuses out of the chloroplast and can then leave the plant. 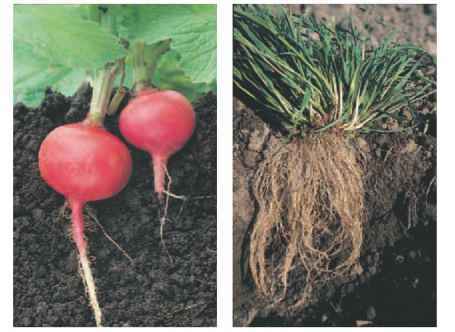 Thus, oxygen is not needed for photosynthesis to occur but is essential for cellular respiration in most organisms, including plants themselves. The splitting of water inside the thylakoid releases electrons, which replace the electrons that leave photosystem II. During chemiosmosis, the movement of protons into the stroma of the chloroplast releases energy, which is used to produce ATP. ATP is the main energy currency of cells. An important part of the light reactions is the synthesis of ATP through a process called chemiosmosis (KEM-i-ahs-MOH-sis). Chemiosmosis relies on a concentration gradient of protons across the thylakoid membrane. Recall that some protons are produced from the splitting of water molecules inside the thylakoid. 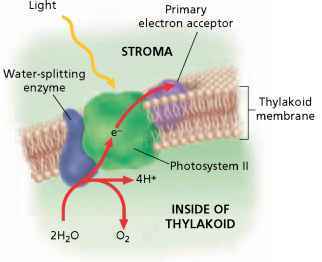 Other protons are pumped from the stroma to the interior of the thylakoid. The energy required to pump these protons is supplied by the excited electrons as they pass along the electron transport chain of photosystem II. Both of these mechanisms act to build up a concentration gradient of protons. 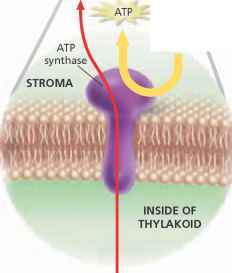 That is, the concentration of protons is higher inside the thylakoid than in the stroma. The concentration gradient of protons represents potential energy. That energy is harnessed by an enzyme called ATP synthase, which is located in the thylakoid membrane, as Figure 6-8 shows. ATP synthase makes ATP by adding a phosphate group to adenosine diphosphate, or ADP. The energy driving this reaction is provided by the movement of protons from inside the thylakoid to the stroma through the ATP synthase complex. Thus, ATP syn-thase converts the potential energy of the proton concentration gradient into chemical energy stored in ATP. As you learned earlier, some of the protons in the stroma are used to make NADPH from NADP+ at the end of the electron transport chain of photosystem I. Together, NADPH and ATP provide energy for the second set of reactions in photosynthesis, which are described in the next section. 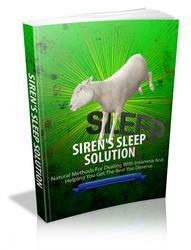 Discover How To Sleep In Peace And Harmony In A World Full Of Uncertainty And Dramatically Improve Your Quality Of Life Today! Finally You Can Fully Equip Yourself With These “Must Have” Tools For Achieving Peace And Calmness And Live A Life Of Comfort That You Deserve! What is inside the thylakoid membrane?